You all know me...many of my family and friends have been affected by this awful disease, but this year is even more devastating. 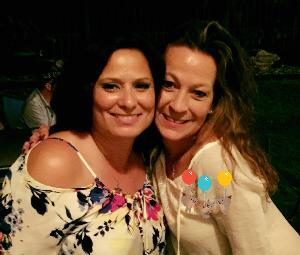 I lost my Best Friend, My Sister from another mister to Metastatic Breast Cancer. Barbara Spero and I met in the Army back in 1986. We made a lot of great memories, some cringe worthy...but those may be the best ones! ... I had the honor of being by her side with her children and husband as she passed from her pain to a heavenly party! I sure hope they have pink bubbly champagne for you my Sister! I'm tired of losing the people I love to Cancer.....most of us know someone who has been affected by this devastating disease. You can make a difference by supporting me in The Ride For Roswell. Funds raised through The Ride support cutting-edge research and compassionate, innovative patient care programs at Roswell Park Cancer Institute. Please consider making a donation today. Any amount helps! Together, we can help find cancer cures and save lives. Feel free to leave the name of someone you'd like me to honor on Ride Day, I will make a streamer for each name and wear it on my 45 mile ride! It would be my honor to do so! Route and departure time: 45-mile Country Route - 8:30 a.m.